If Christmas came tomorrow, I would be in big trouble. Nothing is wrapped. In fact, I’m not even sure that everything is purchased. Nothing is baked. I did bake some Berry Orange Coffee Cakes but those are totally gone. Does that answer the question of whether or not they were any good? No tree yet either. Not really sure when, or if, that will get taken care of. So…enough of what hasn’t been done. Let’s move on to what I have accomplished. The entry. Simple. Neutral. Natural. Easy! I hung my go-to garland on the railing. I can’t use real greenery here because there’s a heat register right under the railing. The mess of dried needles is just not worth it anymore! I love the garland though and it actually looks real…at least that’s what I tell myself. I hung my gigantic pine cones from the garland with ribbon. These pine cones have moved around and end up some place different every year. I think this might be my favorite place so far. 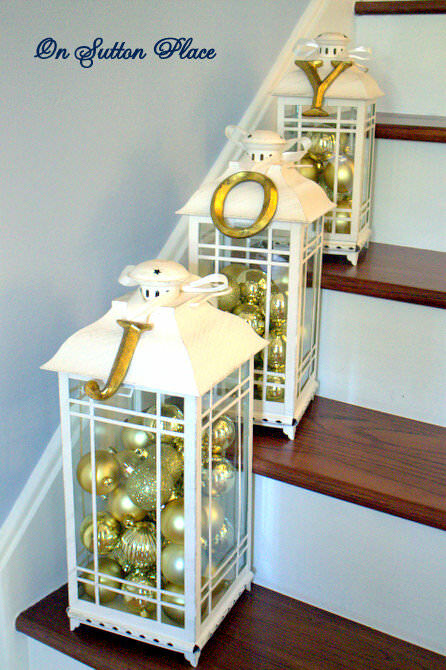 I filled my lanterns with gold balls and lined them up on the stairs. I had the letters from a project that I never completed last year. I used hot glue to attach ribbon and then I just tied the letters on the lanterns. This year I have enjoyed decorating with what I have…without running out and buying something new for every project. I’ve got everything almost finished. Greenery, lights, ribbon, silver, gold and the occasional pop of red. Speaking of which…my winterberries are hanging in there. They have dried up a bit but they are still on the stems. They just need to hang in there for one more week. Sort of like all of us. Here’s hoping we all get our baking, wrapping and hall-decking finished so we can enjoy the weekend with our families. 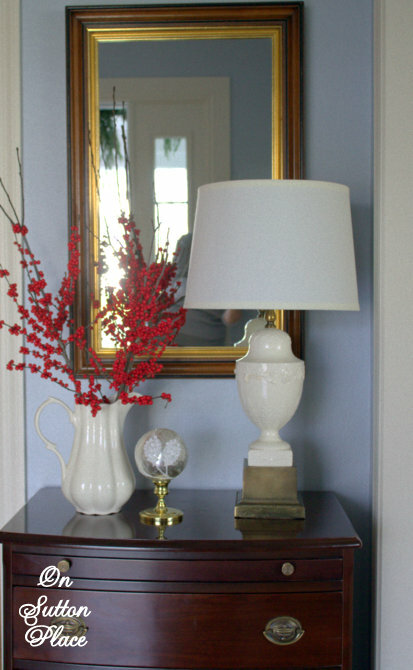 Ann, Thanks for linking up your stunning entry way this week. It means a lot to see you at my party! The large pine cones look beautiful hanging from the garland. What a warm, welcoming entry you have. Very pretty, Ann…LOVE those gigantic pinecones! Gorgeous love the lanterns and joy lettering! Such a beautiful festive home! 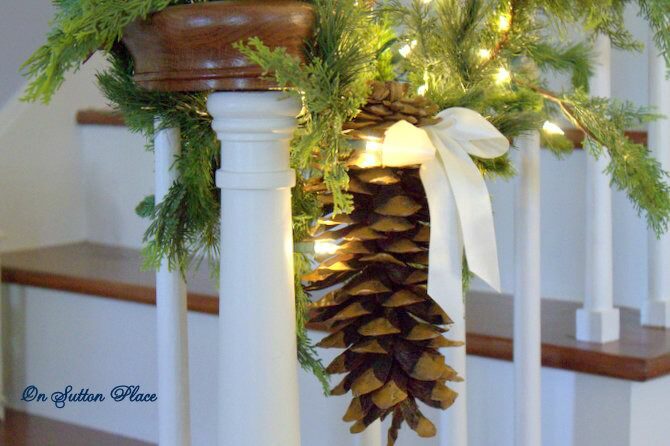 I think your bannister swag is beautiful, Ann, and those gigantic pinecones are awesome! I really like the lanterns lined up on the stairs, too! What a beautiful entry I love the pinecones on the garland and the lanterns on the stairs are stunning. Another great job!! What a gorgeous entry Ann. I am loving those lanterns on the stairs. Merry Christmas to you and your family. I have to go out and finish up today. 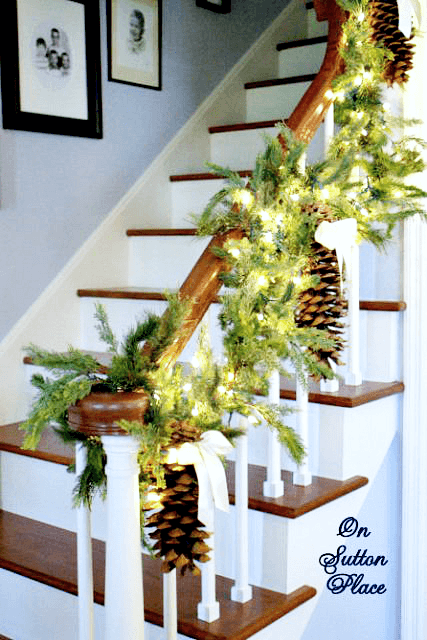 Your entry is gorgeous, I love the huge pinecones on your stairway! It all looks quite lovely! 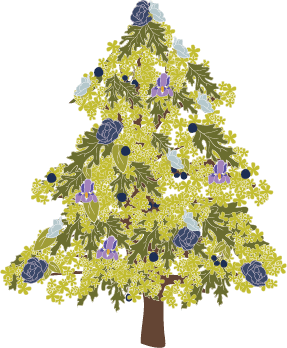 Your staircase and banister are a lot like mine – I’m going to have to look for a nice bit of garland – I have the big pine cones! One week – where on earth has the time gone? Honestly, this whole year has been amazingly speedy. In case I don’t get the chance, do have a wonderful Christmas. The greenery on the stairway rail looks so real. Beautiful Christmas decorating. I absolutely love your greenery!! It looks so real! That’s exactly what i have been searching for…by any chance do you remember where you purchased it?? Thanks and good luck getiing ready for the holidays! Your decorations are gorgeous! I have pine-cones like that from N.C. They are huge and wonderful! I love your elegant entry. Your entry way is beautiful!!! I love it Ann. The greenery does look real, I thought it was. I have a few more things to do, not much. Your greenery looks very real to me! 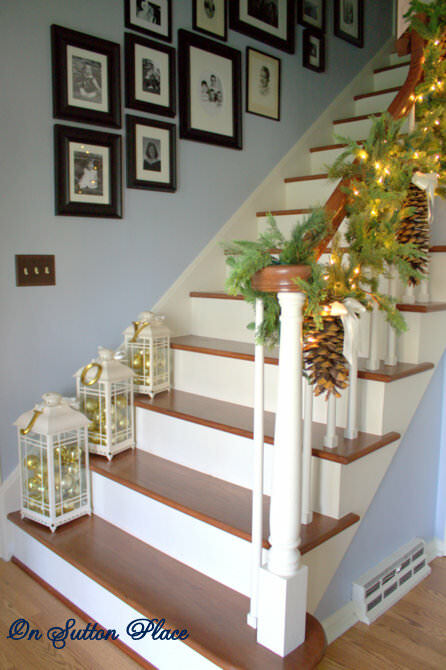 The pine cones look fabulous hanging on your banister and the lanterns look very…joyful! Nothing is finished around here, and I’m giving my mother a 90th birthday party this Saturday! Then I’m hosting our family’s Christmas Eve party! I just looked in my oven and it needs cleaning!!! Yikes! I’ll just be a whirling dervish cleaning and baking fool for the next few days! Very pretty! I love your lanterns and pine cones! The garland does look real. I love the pinecones and other decorations. it sure looks good from here at your house ann! happy holidays to you! Your entry looks great, Ann! That garland looks real enough to me. : ) Love the large pinecones. MERRY CHRISTMAS ANN!! The important things always seem to get done just in TIME!!! Read my blog post today, I am sure you have taken care of the reallllly important things. Ooooo, love those pinecones and your J-O-Y-ful lanterns … simply gorgeous and resourceful!! The entryway is beautiful. I love those pine cones! I’m not ready either…not even close :) Merry Christmas!!! It’s lovely – I love those huge pinecones! And your garland looks real in photos – I’m sure it’s just as real looking in person! Your banister greenery looks real! I cannot use real greenery and breathe at the same time. I have had my tree up a long time only because my kiddo insisted and she helped. Happy Christmas Ann. Your entry looks gorgeous! I thought the garland on the bannister was real. Loving the huge pinecones hanging off the garland. The lovely decorative detail in your home is always a pleasure to see! Ann…your entry is so pretty!! My decorating is done…but not my shopping or my baking. Not to mention, the wrapping that will still need to be done. I love those giant sugar cones (or whatever they are) hanging off your stair banister. The white ribbon is a nice added touch too. The lanterns on the steps is a great idea too. I have made a “to do” list for me to follow this week to keep me focused. I’ve still got more to do as well and am feeling the pressure! Making dents already though. I would never have guessed that your rail greenery wasn’t real. It is beautiful, and I like that it has a variety of greens in it. I have no gifts to wrap this year, the kids just want money:( I am free to do your wrapping. LOL I actually love to wrap gifts. I agree totally that these huge pine cones should be on the staircase!!! What an amazingimpression upon entering your home at Christmas!!! Exhale,dear friend, you have ONE more week…7 full days to get ready!!! Your entry is beautiful, all dressed up for the holidays is stunning! Merry Christmas! Holy Pine cones! This is so pretty, actually everything about it is beautiful! I have no idea what I bought either – it’s all shoved in boxes hidden deep in my basement! But at least you have your gorgeous foyer – I love those giant pine cones. 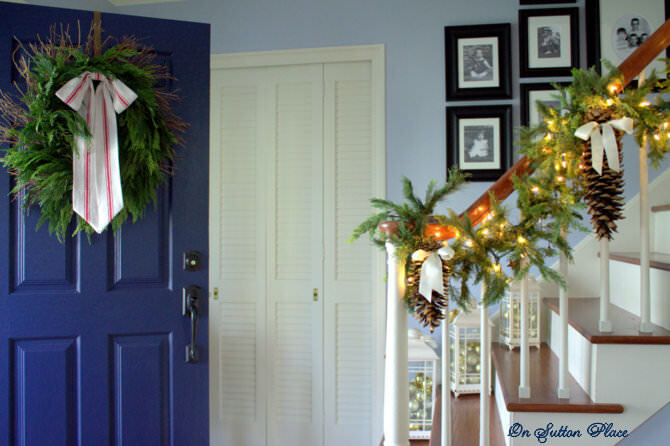 I tired real garland last year – it crumpled up in about 2 days and needles were everywhere! No thank you – faux is the way to go! Your entry is very welcoming, warm and pretty. Thanks for sharing. Merry Christmas to you and yours. Your garland looks perfect. Those pinecones are amazing. I am feeling overwhelmed by the decorating this year. But at least all my gifts are wrapped and most of the cookies are baked. Of course, I still haven’t ordered the Christmas tenderloin or bought any groceries to prepare for the incoming horde (okay, only two) of college students. Yikes, better get busy! Your entry is lovely. I don’t think you are alone in not being ready. This will be a busy week. I’m not sure if all my gifts are bought either! I have about half wrapped though. And I’m finally mailing my Christmas cards today. WHEW get that off the to-do list! 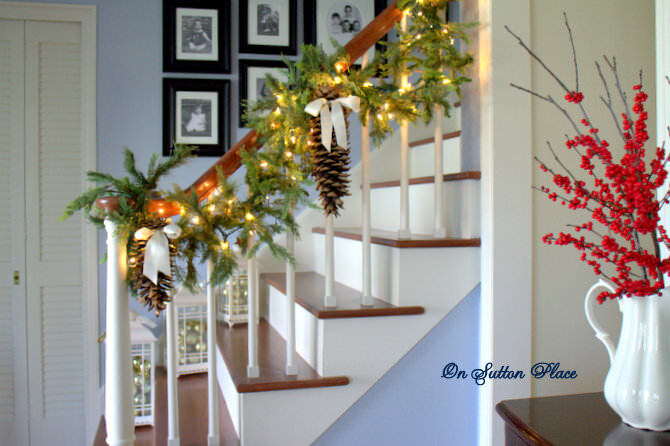 Love that banister and pinecones! :) My decorated banister makes me so happy this year!